Reports from cities in revolt. Since activists first set up camp in Lower Manhattan’s Zuccotti Park on September 17, scores of protests and occupations have sprung up across the country as part of the Occupy America movement. Here are a few of the major sites where students, activists and ordinary Americans have occupied spaces in their cities to demand economic and social justice, and why each occupation matters. 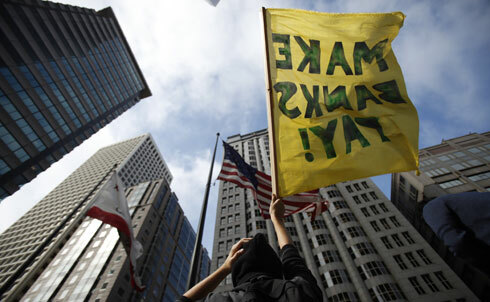 The San Francisco movement, now backed by unions and community groups, organized a march Wednesday morning called Foreclose on Wall Street, which organizers estimate drew 500 plus demonstrators, including Naomi Klein. Two hundred of those protesters temporarily shut down the headquarters of Wells Fargo and posted foreclosure notices on the bank’s doors. Eleven were arrested. Both the police and Mayor Edwin Lee have issued statements in support of protesters’ freedom of speech and assembly. The mayor even delivered porta-potties. 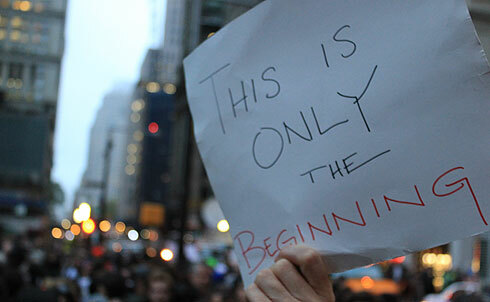 One of the first cities to follow New York’s lead was Chicago, and in many ways Occupy Chicago could serve as a model of legitimacy so urgently needed by the movement. Some members of Occupy Chicago have drafted a concrete list of demands to focus their efforts, though organizers say internal reactions have been mixed. Activists are also proud of their open dialogue with police, saying some individual officers have expressed interest in joining them. 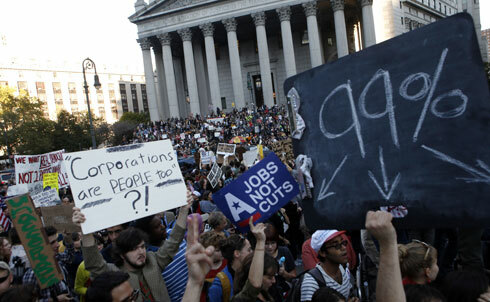 “I never heard about [Occupy Wall Street] in advance,” said Occupy Boston organizer Robin Jacks of the demonstration in Zuccotti Park. But after seeing reports of police brutality at the New York protests on Twitter, Jacks quickly secured the @Occupy_Boston handle. 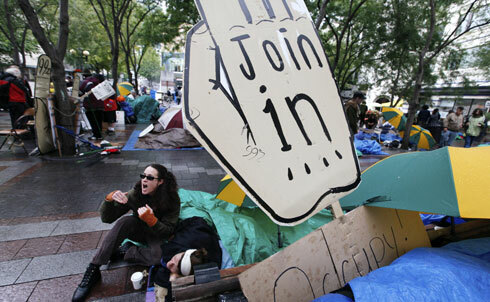 The group held its first General Assembly two days later, choosing September 30 as the starting date for its occupation; they have been camped out in downtown Boston’s Dewey Square ever since. 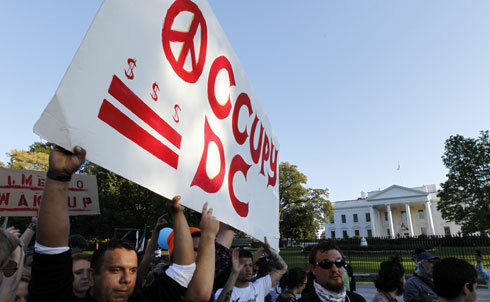 OccupyDC has taken up residence in McPherson Square, right along the lobbyist center of K Street and just blocks from the White House. Like their fellow occupiers off Wall Street, the OccupyDC protesters conduct general assemblies and committee meetings each day, and have made several forays out to march against the symbols of corporate greed and malfeasance in the nation’s capital. One solidarity march with the SEIU’s Justice for Janitors rally led the occupiers through K Street before returning the square. And OccupyDC isn’t even the only occupation currently underway in DC: the group Stop The Machine have been occupying Freedom Plaza since October 6. STM occupied the square in opposition to the tenth anniversary of the invasion of Afghanistan and the start of the “War on Terror,” and their recent protest against the National Air & Space Museum’s drone exhibit and their protest against war policies in the Hart Senate Building have received some good media attention. Occupy LA didn’t really get going until Rose Gudiel got kicked out of her house. A state employee from La Puente with pink cat-eye glasses, Gudiel was foreclosed on by OneWest Bank, even after she repeatedly petitioned to modify her loan due to extenuating circumstances (her mother, 63, is disabled; her brother, who once provided a significant amount of the family’s income, was gunned down in 2009). Union leaders and occupiers formed a vigil around the bank president’s rambling Bel Air mansion and surrounded the Gudiel home, in an attempt to physically keep the police from evicting the family. Gudiel and five others were arrested, but the bank eventually relented. The Gudiels kept their home. The success provided the spark needed for LA’s occupation, and now nearly 400 young activists have set up their tents in front of City Hall—making Occupy LA the second-biggest occupation in the country. 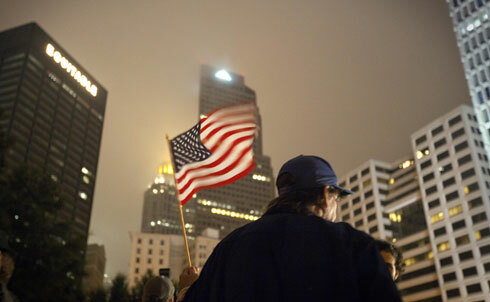 Despite the protest’s contentious beginnings, Los Angeles’s protesters have faced much less harassment from authorities than their fellow occupiers in Boston, Atlanta and other corners of the nation. 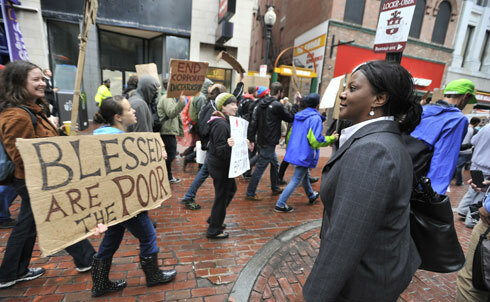 “We have a cakewalk compared to New York,” activist Allen Eaton told The Atlantic several days ago. 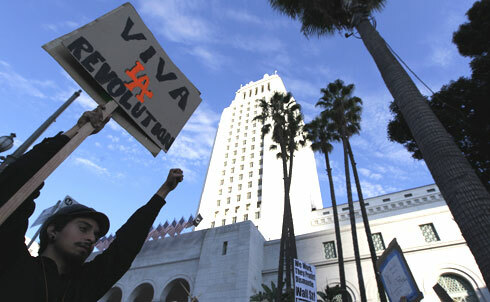 Occupy LA enjoys the active support of local celebrities and the LA City Council. Council member have visited the occupiers’ tent city—going so far as to exchange hugs with protesters. This Wednesday they even passed a resolution declaring the city’s official support for the protests. Occupy Seattle has planned a “night of 500 tents” for Saturday, October 15, with the hope that a critical mass of occupiers will make evicting them from the plaza park impossible. 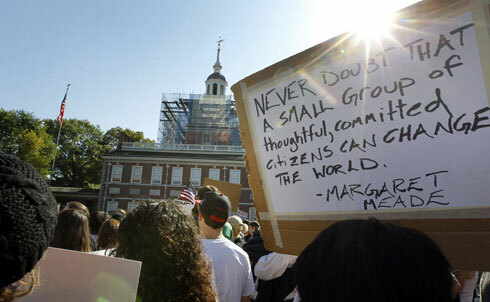 Occupy Philly members have joined a labor rally for jobs legislation and a march targeting Wells Fargo. Philly Jobs with Justice Executive Director Gwen Snyder says that Occupy Philly is currently planning an action targeting the city’s recently imposed curfew, an “edict from Mayor [Michael] Nutter that really targets Black youth.” Snyder, Occupy Philly’s designated “labor bottom-liner” says she’s been impressed by the group’s ability to move forward quickly, democratically and inclusively. She estimates seventy to 100 people have been sleeping there each night. OccupyMN’s efforts are targeted at the local and regional banks, demanding “a people’s budget” that begins with banks paying a fair share of the federal deficit. In the week that OccupyMN has been operative it has held three marches to major banking institutions and has demanded to meet with top banking officials to discuss responsible banking practices and the state’s foreclosure crisis. According to Kevin Whelan, activist and Communication Coordinator for the coalition Minnesotans for a Fair Economy, the “people are finally coming together with concrete campaigns that community and faith-based organizations have been working on,” but the “upsurge in energy” he says, lies in “new people” coming into the fold. Occupy Atlanta kicked off officially in downtown Atlanta on Friday, October 7, with about 200 people gathering at Woodruff Park, or “Troy Davis Park,” as it has been renamed by the occupiers. Congressman and civil rights movement leader John Lewis visited the rally on the first day, but the General Assembly voted to not allow him to speak during the assembly on the grounds that no voice should be given precedence over any other, an incident that has caused quite some controversy. Victory like this, however, will probably come with a much higher price for the occupiers in the near future. Mayor Kasim Reed gave occupiers until next Monday to vacate the park, after he returns from DC, where he will give a speech at the new Martin Luther King Jr. Memorial. Perfect timing. Of course, these are just some of the largest occupations currently underway—more are popping up from Portland, Oregon to Portland, Maine, and many places in between. 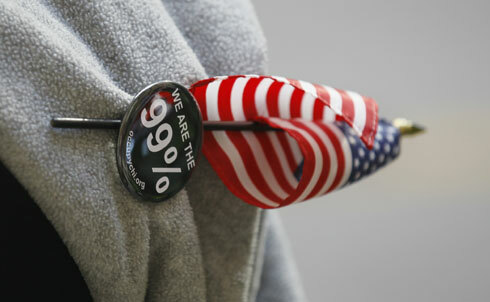 For more on the Occupy Wall Street movement, visit The Nation‘s special section front for the protests.